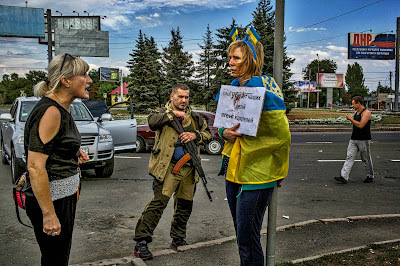 DONETSK, Ukraine -- On the sidewalk of a busy street beside a checkpoint, a bearded gunman wrapped a woman in a Ukrainian flag and forced her to stand, sobbing in terror, holding a sign identifying her as a spotter for Ukrainian artillery. 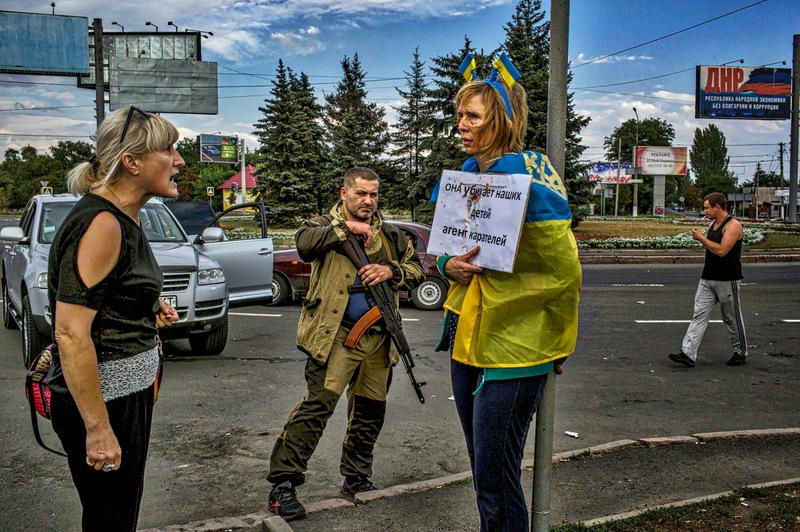 Ukrainian woman being humiliated by drunken pro-Russian criminals. “She kills our children,” it read. Because the woman was a spy, said the gunman, a pro-Russian militant, everything that would happen to her would be well-deserved. Passers-by stopped their cars to get out and spit, slap her face and throw tomatoes at her. She struggled to mumble in protest of her innocence and to shake her head in denial. The public humiliation of prisoners came as the presidents of Russia and Ukraine prepared to meet for peace talks in Minsk, the capital of Belarus, on Tuesday. The taunting and provocation appeared to be aimed at dissuading the Ukrainian government from accepting a settlement that might forestall a broader Russian intervention, a development that separatists here are banking on as their military fortunes wane. Further muddying the prospects for a diplomatic breakthrough, Ukraine accused Russia on Monday of opening a new front in the war by sending an armored column across the border from Russia south of the Ukrainian lines that surround the rebel capital, Donetsk. The Russian government dismissed the accusation and the foreign minister, Sergei Lavrov, speaking in Moscow, said that Western governments should not expect Russia to make all the concessions in a settlement and that Ukraine, too, would have to compromise. The Ukrainian military said 10 tanks and two armored infantry vehicles manned by Russian soldiers disguised as separatist fighters had crossed the border near the town of Novoazovsk and engaged in combat with Ukrainian border guards. The claim could not be independently confirmed. Also on Monday, Russia announced it would send a second convoy of humanitarian aid to eastern Ukraine across a border area controlled by pro-Russian separatists; Ukrainian officials say the movement of goods is calculated to undermine the country’s sovereignty. The drama that played out on the streets of Donetsk Monday seemed sure to ratchet up tensions. A military unit of Russian nationals from the region of North Ossetia, in southern Russia, held the woman at a checkpoint in a roundabout in Donetsk known as “the Motel,” for a nearby hotel. The men, smiling and gesturing toward the woman, waved over cars for drivers to observe or take part. “We should hang you on the square,” one woman in the crowd yelled, then walked up and spat in the face of the victim, then kicked her in a thigh, causing the woman accused of spying to stagger back. At times, the pro-Russian soldiers posed beside the crying woman to take selfies on their smartphones, or playfully twirl her hair with their fingers. At one point, a fighter walked a few paces back, crouched in the street and aimed a Kalashnikov rifle at the woman in a mock execution. The woman shut her eyes. “Open your eyes, stand up straight!” another of the gunmen yelled. A call placed by The New York Times to an aide for a senior separatist commander informing him of the abuse resulted in the rebel soldiers at the checkpoint briefly detaining the journalists. The aide, who uses only the nickname The Georgian, sent a car with gunmen to extricate the suspected spy and journalists from the Motel. The two groups of gunmen agreed to release the journalists, but were not able to agree on handing over the woman. After the discussion, the captors drove her away to an unknown location. The man known as The Georgian, who is a member of the Vostok Battalion, which consists of mostly local Ukrainians, said the Ossetian volunteers at the Motel checkpoint do not report to Ukrainian commanders, so nothing further could be done. He said he condemned the abuse. At the peace talks in Minsk, President Vladimir V. Putin of Russia and President Petro O. Poroshenko of Ukraine will be joined by representatives of the European Union and the Russia-led Customs Union, including the presidents of Kazakhstan and Belarus. Although the talks offer some hope for a negotiated settlement to the conflict, both Putin and Mr. Poroshenko are under strong pressure from nationalists at home to press on militarily. Oleh Voloshyn, a former Ukrainian diplomat, said in a telephone interview from Kiev, the Ukrainian capital, that Mr. Poroshenko will use the summit meeting to ask Putin to halt the flow of Russian volunteers and military hardware across the border and may offer, perhaps in private talks or via subordinates on the sidelines, autonomous status for portions of eastern Ukraine in exchange. The Ukrainian government, however, will not accept any legitimization of the main rebel group here, the Donetsk People’s Republic, Mr. Voloshyn said, particularly after the public abuse of prisoners. “After yesterday’s parade of prisoners of war, the sympathy toward the people of the Donbass is low in other regions in Ukraine,” he said, making it politically difficult for Mr. Poroshenko to negotiate, something that factions in the separatist movement intent on drawing in Russian peacekeepers want, Mr. Voloshyn said. In Moscow, Lavrov, the foreign minister, was questioned about the parade held Sunday in which prisoners of war from the Ukrainian Army were displayed. Lavrov said the parade did not appear to meet that standard. “I saw a picture of this parade,” he said. I just wonder how they will feel when they are the ones on display. Because the day will come, either with someone privately or in public, when they will be humiliated by what they have done to other human beings. I also support the idea of treating those who humiliated civilians as war criminal and they should be given a trials for crimes against humanity.